Keeler, O.B. and Rice, Grantland; Bobby Jones. London: Fireside Press by W. Foulsham, 1953. 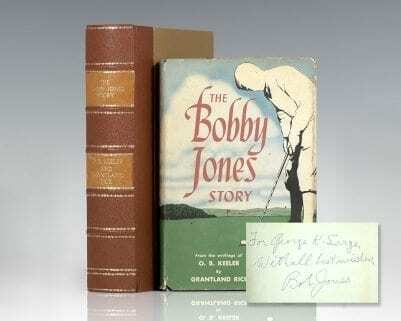 First British edition of this biography on the legendary golfer Bobby Jones. Octavo, original cloth, illustrated. Preface by Bobby Jones. With a Special foreword by Bernard Darwin. Name to the endpaper and dedication page, near fine in a near fine dust jacket. Taken from the writings of journalist O.B. Keeler who closely followed Bobby Jones’ career and co-wrote Down the Fairway. “Jones left an enduring legacy of athletic prowess and exemplary personal characteristics. No one is likely to break his records of 13 U.S. and British national championships, and four in one year (he won the U.S. Open a total of four times, the U.S. Amateur five times, the British Open three times, and the British Amateur one time)… The Masters seems to have a secure place in the pantheon of golf; and the name Bobby Jones will continue to represent the highest standards of amateurism, sportsmanship, and self-mastery” (ANB). Donovan & Murdoch 31770. Atlanta: Tupper & Love, 1953. 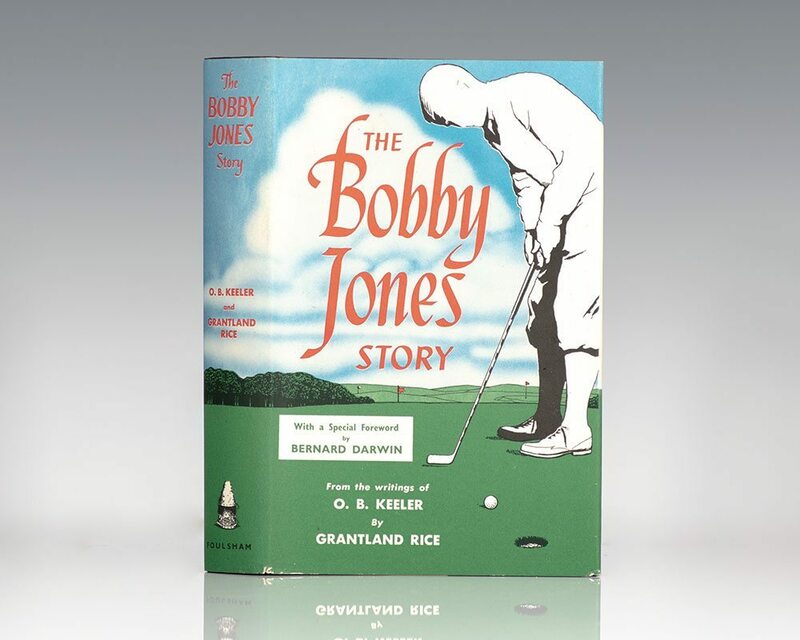 First edition of this biography on the legendary golfer Bobby Jones. Octavo, original cloth, illustrated. Boldly inscribed by Bobby Jones on the front free endpaper. Near fine in a very good dust jacket with light rubbing and darkening to the spine. Rare and desirable signed by Bobby Jones. First edition, second issue (same year as the first issue) of this biography on the legendary golfer Bobby Jones. Octavo, original cloth, illustrated. Boldly inscribed by Bobby Jones on the front free endpaper, “For George K. Large With all best wishes, Bob Jones.” The recipient of this copy was Judge George K. Large, who served as Special Assistant Attorney General in the famous 1935 Lindbergh kidnapping trial. Near fine in a very good dust jacket with light rubbing and darkening to the spine. Housed in a custom half morocco clamshell box. Rare and desirable signed by Bobby Jones.